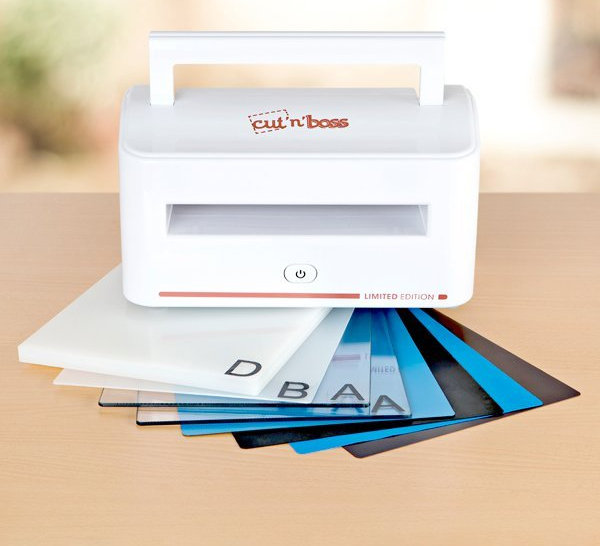 Now you can die cut and emboss your projects using just one machine thanks to this incredible Cut ‘N’ Boss, brought to by Craftwell. Designed with practicality in mind, this machine is compact and portable, meaning you can craft with it wherever you go. It features a metal mechanism which is robust and durable, and has been specifically designed with safety in mind. This must-have machine is also extremely versatile. It easily cuts through multiple layers of material in one pass, including paper, card, vellum, felt, fabric, balsa wood, leather, rubber, thin sheet metal, chipboard, acetate, and more, as well as embosses many of these materials. It also comes with all the necessary elements to complete the machine. You will receive four platforms, two magnetic shims, two rubber embossing mats, a power adaptor and a comprehensive user manual. The machine accepts project sizes up to 8.5″ x 24″ thanks to the extended platform.